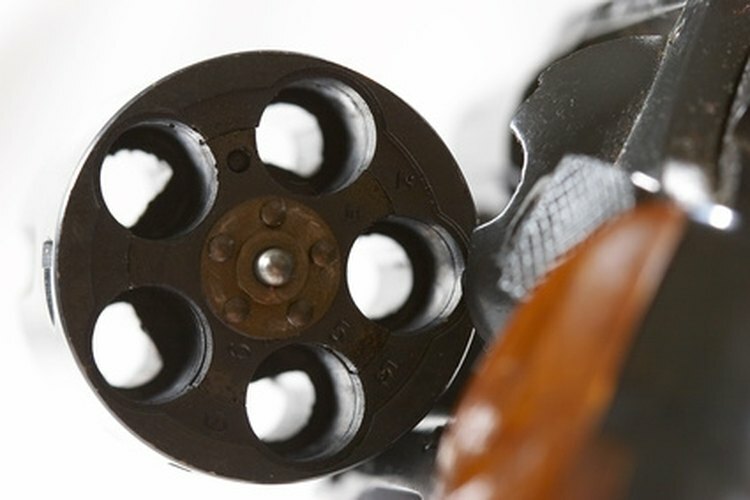 A five round cylinder on a revolver. The Smith and Wesson 642 revolver hand gun fires .38 special type ammunition from a 5 round chamber (See Reference 1). The gun has become an action movie icon over the years, finding a home in the ankle revolver of your average gumshoe detective or aging law man. If you plan on owning and operating a gun, it is important that you follow the right safety procedures and fully understand the proper way to operate your weapon. Press the cylinder latch and use two fingers to press the bullet cylinder through the gun's frame and outwards. The cylinder latch is a small button located on the left side of the gun just above the grip and behind the cylinder (See Reference 1). Load each round of .38 special ammunition into each individual chamber. If you have a speed loader you can insert all five rounds into the chamber at one time. Press the cylinder back into the gun's frame until it locks in place. Choose an inanimate object for target practice, such as a paper target or a soda can. Remember to only operate your firearm in a place where it is safe and legal to do so, such as a firing range or hunting ground. Adjust your stance so that you are facing the target. You're going to want to have the leg on the side you're shooting from forward with the opposite leg staggered back, keeping your hips aimed at a 45 degree angle towards your target (See Reference 2). If you're firing with both hands, keep the angle of the hips but put your opposite foot forward (See Reference 2). Adjust your grip on the handle of the revolver. You're going to want to have the web of your hand resting on the top of the gun's handle (See Reference 2). This grip will allow you to have better control of the muzzle jump and give you a more accurate shot (See Reference 2). Aim down the front sight of your handgun. The way the human eye works won't allow you to focus on the back and front sights at the same time, so keep an eye on the one closest to the barrel. Pull the trigger in a smooth, uninterrupted motion. Squeezing the trigger in a jerking motion or moving your other fingers on the handle while you're firing can throw your shot off target. You can practice getting used to pulling the trigger without moving your other fingers by "dry-firing" your weapon, or pulling the trigger with no ammunition loaded. Guns can be extremely dangerous if used improperly and can cause severe injury and death to you or those around you. Always exercise proper safety and only operate your weapon in places designated for such recreation.